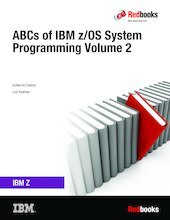 The ABCs of IBM® z/OS® System Programming is a 13-volume collection that provides an introduction to the z/OS operating system and the hardware architecture. Whether you are a beginner or an experienced system programmer, the ABCs collection provides the information that you need to start your research into z/OS and related subjects. If you want to become more familiar with z/OS in your current environment or if you are evaluating platforms to consolidate your e-business applications, the ABCs collection can serve as a powerful technical tool. Overview of the parmlib definitions and the IPL process. The parameters and system data sets necessary to IPL and run a z/OS operating system are described, along with the main daily tasks for maximizing performance of the z/OS system. Basic concepts related to subsystems and subsystem interface and how to use the subsystem services that are provided by IBM subsystems. Job management in the z/OS system using the JES2 and JES3 job entry subsystems. It provides a detailed discussion about how JES2 and JES3 are used to receive jobs into the operating system, schedule them for processing by z/OS, and control their output processing. The link pack area (LPA), LNKLST, authorized libraries, and the role of VLF and LLA components. An overview of SMP/E for z/OS. An overview of IBM Language Environment® architecture and descriptions of Language Environment’s full program model, callable services, storage management model, and debug information.